Mid-Atlantic Eye Physicians - Cataracts - What is a cataract? Cataracts - What is a cataract? Cataract surgery is considered one of the safest surgical procedures in the US. A cataract is a clouding of the eye's lens which causes vision problems. Usually cataracts are related to aging. Over half of all Americans over age 65 have a cataract. The lens of the eye is made to let light pass through and focus on the retina, and is made up of water and protein. Sometimes as we age some of the protein will clump together making small cloudy areas on the lens. These cloudy areas or cataracts interfere with vision by preventing the light from reaching the retina. As time passes, the cataract may grow, making it harder to see. Vision through cataracts becomes dull and blurry, and cataract removal surgery becomes necessary. There is no known cause for cataracts at this time. These or other changes in your vision can be a sign not only of cataracts, but other eye problems as well. If you have any of these symptoms, please call Mid Atlantic Eye Physicians and our team of Eye M.D. 's (Ophthalmologist) will be ready to talk with you. A cataract is a clouding of the eye's lens which causes vision problems. Usually cataracts are related to aging. Over half of all Americans over age 65 have a cataract. There is no known prevention for cataracts, but fortunately cataract surgery is one of the safest and most successful procedures performed today, improving vision in over 98% of cases in which surgery is recommended. Cataract surgery has experienced tremendous advancements over recent years, and Mid-Atlantic Eye Physicians has kept the pace. This sight restoring procedure has provided a higher quality of life for many patients who used to suffer from poor vision as a result of cataracts. Older, more conventional methods of cataract surgery use a large incision to remove cataracts. The small incision surgery utilized by Dr. Crichlow allows the incision to heal naturally with no stitches. Faster healing time allows you to return to normal activities sooner. Believe it or not, there has never been a better time to have cataract surgery. Today, patients can choose from a wide variety of replacement lenses - and the results can be extraordinary. Depending on the lens you choose, you could have clear, sharp vision with little to no need for corrective eyewear in some instances. Monofocal lenses have a single focal point for clear distance vision. However, while distance vision is usually improved, most patients still need to wear glasses for up-close tasks, like reading or working at a computer. These types of lenses, such as Acrysof IQ Toric IOL, are specifically designed for patients with astigmatism. Similar to a monodical IOL, these lenses offer much improved distance vision, though patients will usually still require glasses for near-vision activities. Multifocal lenses, like the AcrySof IQU ReSTOR are designed to provide a full range of clear, sharp vision. 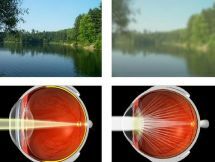 These lenses restore cataract-impaired vision and can correct for nearsightedness, farsightedness, and presbyopia. At Mid Atlantic Eye Physicians, our caring staff will help you determine which lenses is right for you based on your eyes, your visual needs and your lifestyle. Feel free to ask as many questions as you like. Click Here to contact us!